In August of this year I’ll be returning to one of the most beautiful places I’ve ever visited – Alaska. I’ll be doing a cruise with Reid Tracy, president of Hay House, and teaching an experiential version of our Speak, Write & Promote workshop. For more info on this exciting event, you can now read more here. If you think you’re not an artist, think again. Ever since I was twelve years old, I’ve called myself a writer. The title felt legit. I didn’t need to publish a book or have a byline in a magazine. As far as I was concerned, the fact that I kept a journal and wrote in it nearly every day gave me license to call myself a writer. Calling myself an artist, however, was a different story. My husband Michael is an artist. He started cartooning in grade school and continues to this day. He also has a gift for architecture and design. His sensitive and creative eye is reflected throughout every room of our home. He’s always been the artist in the family. Many years ago, during a family reunion, my brother-in-law, Walter, did something that roused a sleeping part of me. He created a special family game with personalized nametags and when he handed me mine it read, “Artist.” I looked at him, looked at the nametag, looked back at Walter to be sure he’d given it to the right person, and when he nodded yes, I stuck it to the front of my shirt. As soon as I took possession of the title, something weird happened. I had a vision of a little girl inside me jumping up and down screaming, Yes! Yes! Yes! Who is this kid, I wondered. That nametag was an invitation to marry passion with desire. An invitation I would ignore for the next fifteen years. Dr. Chris Northrup, the wise woman who wrote The Wisdom of Menopause, said that when a woman reaches the perimenopause stage of her life, things that hadn’t been dealt with during her adolescent years would come up again to be experienced and healed. If she dealt with this unhealed stuff, she also had a good chance of reconnecting with the dreams that ignited her heart during the vulnerable years of puberty. You know, the parts of us that often got trampled, distorted, ignored, or driven out by authority figures who met with the same fate. Well, as I entered the perimenopause period of my life (pun intended), that’s exactly what happened. I was confronted with lifelong patterns that needed to be healed and released. Patterns like trying to rescue people who didn’t want to be rescued, or the need to perform to achieve a level of success that mattered more to others than my own soul. Confronting these patterns meant also confronting the parts of me that were arrogant (I knew what others needed), manipulative (I tried to get them to see it), and controlling (General Manager of the Universe, remember?). As unattractive as these parts were, I held onto them. Who would I be without the roles that defined me for most of my life? Well, as I’ve turned a corner on this particular healing stage of my life, I’ve become reacquainted with that screaming little girl and she’s offered me a far better role. Turns out she’s the artist and, because I’ve paid attention to her this time around, she’s begun running the show. 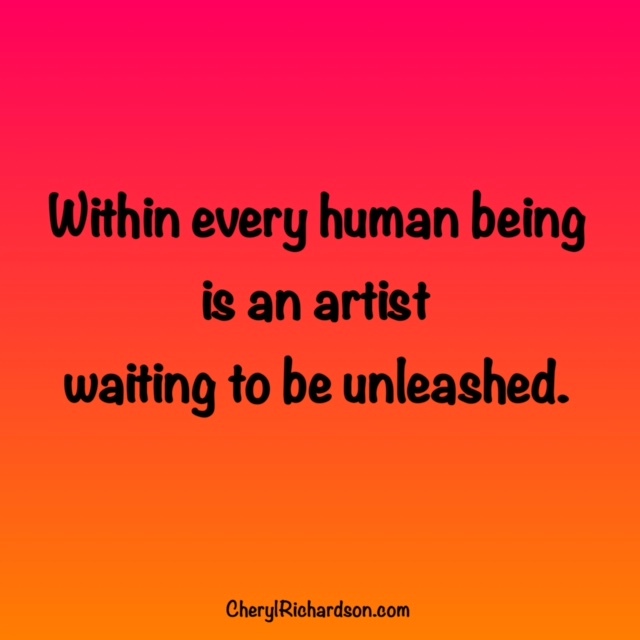 Each one of us has an artist inside begging to be seen and heard and paid attention to. She wants to build something. He wants to create. We all want to experience the magic of losing ourselves to something mysterious and light-filled and transcendent. Yes, I’m a writer – an artist. The blank page is my canvas. Words are my paint, my pastels, my pens. But I’m also much more. I’m a woman who loves to express her creativity in a variety of ways. I’ve started singing for the sheer joy of it. I’ve transformed my home office into a sensual, French salon. I’m indulging my love of fashion and integrating a fresh level of depth and creativity into my work. Maybe you’re the dad who makes the best brownies in town, or a singer who adds just the right notes to her church choir. You might be a carpenter who makes magic with a hammer and nails, or an electrician who’s gifted at putting together the most outrageous holiday light show for your neighborhood. The point is to listen – to pay attention to that little kid inside you who has his or her hand on the ribbon tied to your creative spirit. Here’s a video of a unique artist who loves cats. Check out what he’s done to his home here. Thanks, Robin!